Shaped like flattened footballs, and heady with dried mint, cumin and Greek oregano, these meatballs are mighty meaty and plenty juicy. They can be served as a meze or appetizer with bread. But I enjoyed them as a satisfying main course with couscous and a green salad. “Spiced Meatballs with Green Olive & Tomato Sauce” is from the new cookbook, “Kokkari: Contemporary Greek Flavors” (Chronicle Books), of which I recently received a review copy. The cookbook was written by Erik Cosselmon, chef of Kokkari, the acclaimed upscale Greek restaurant in San Francisco; and food writer Janet Fletcher. It’s filled with favorites from the restaurant, including whole fish roasted with tomato, potato, fennel and olives; egg-lemon soup with chicken and rice; and okra with tomato, saffron and dill. Kokkari, along with its sister restaurant Evvia in Palo Alto, have been long-time favorite establishments of mine. Step into either and you can’t help get caught up in the warmth and vivacity of the ambiance, as well as by the the bold flavors of the food, bright with lemon, olives, feta, tomatoes and lush olive oil. 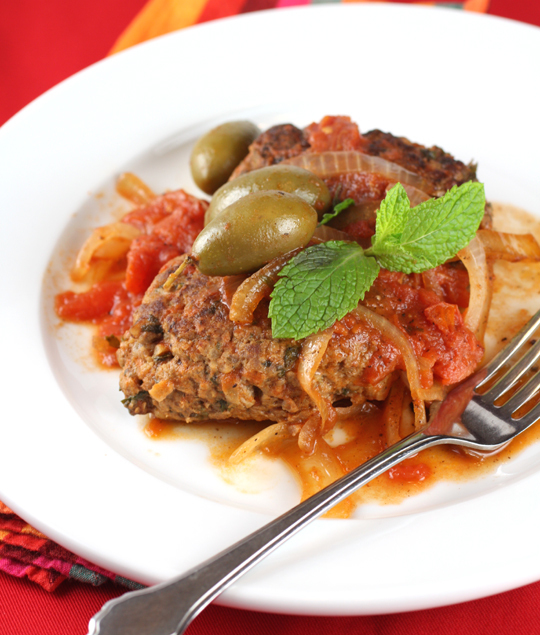 Made with a combo of ground lamb, ground beef and grated onion to keep them very moist, these hefty meatballs are seared, then finished cooking in a simple sauce of canned tomatoes and green olives. 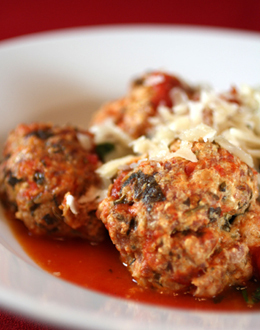 As an appetizer, the dish serves six, with one good-sized meatball per person. As an entree, it probably serves three, with two meatballs per person. These meatballs are wonderfully tender and with a lovely hit of cumin and mint — a nice change-up from the usual Italian version. 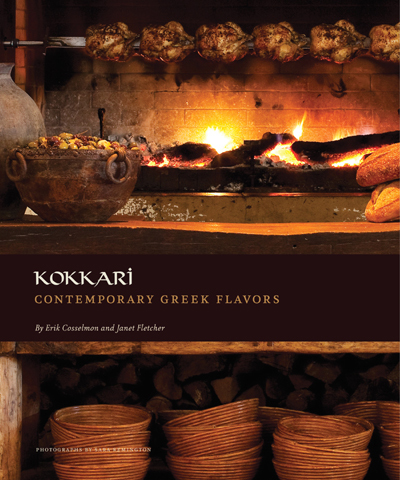 Contest: One lucky Food Gal reader will win a copy of the new “Kokkari” cookbook. Entries, limited to those in the continental United States, will be accepted through midnight PST Oct. 22. Winner will be announced Oct. 24. You know the saying, “It’s all Greek to me”? Just tell me what you find incomprehensible — and why. Best answer wins. Winner of the Previous Contest: In the last Food Gal contest, I asked you to tell me your favorite thing about Sonoma County. Best answer wins a pair of weekend tickets to “A Wine & Food Affair,” Nov. 5-6 in Sonoma County. For the meatballs: Combine meat, grated onion, mint, parsley, oregano, dried spearmint, cumin, bread crumbs, mustard, egg yolk, and vinegar; and mix well with your hands. Season with 1 teaspoon salt and pepper to taste. Divide into 6 equal portions. Shape each into an elongated patty about 3/4 inch thick, 2 inches wide at the middle, and tapered at the ends. In a 10-inch skillet, heat 1 tablespoon olive oil over high heat until smoking. Add a few of the meatballs, then the rest as the first ones shrink. Sear until well browned and crusty on the bottom, about 1 1/2 minutes on each side. They will finish cooking in the sauce. Transfer the meatballs to a plate and pour off all but 1 tablespoon fat. Add the sliced onion, garlic, and a pinch of salt to the pan and saute for about 1 minute to soften the onion slightly. Remove from heat and add wine, cumin, and oregano, crumbling it between your fingers. Add green olives and tomatoes, breaking the tomatoes up between your hands. Bring to a simmer over high heat. Return the meatballs to the skillet. Cover and reduce the heat to maintain a gentle simmer. Cook for 15 minutes, turning them halfway through. Serve hot, garnished with a little chopped fresh mint and a drizzle of olive oil.